If you’ve ever read a horse-themed fiction book and were frustrated by how much time was devoted to explaining the equestrian world to outsiders, you’ll want to pick up one of Natalie Keller Reinert’s novels. Natalie intentionally writes for an audience who are already intimately knowledgeable about horses and riding, so you can jump in and feel like part of the stables from the start. We caught up with Natalie to learn more about her writing inspiration and get some advice for aspiring horse fiction writers. Natalie Reinert grew up competing in Eventing on the United States east coast. She became involved in Thoroughbred rescue and second careers, even taking a job galloping racehorses at the Aqueduct racecourse in New York City, which spawned a popular blog, “Retired Racehorse.” She was able to leverage her blog’s massive audience with well-known guest posters into a large readership for her first book, “Horse-Famous”, a collection of three short stories. Natalie has since published an amazing 13 additional books over the last eight years, in four different series: Heroines on Horseback, Show Barn Blues, Alex and Alexander, and The Eventing Series. She was also included in Deck the Stalls, an anthology of holiday equestrian stories. She has won over bookworms of all ages, from teens to retirees. In addition to the verisimilitude in her works, realistic horse themes grab readers and keep them glued to the page. Once Natalie has a character and a big life problem to solve, she goes to work creating a novel around them. She typically writes some sketches or scenes first to introduce herself to the material more fully, from the people and horses to the spaces where they ride. Outlining is the most agonising part, she confesses, but eventually she gets about half a novel out in spurts and starts. Then, she usually makes some changes to the plot before continuing to the end. She completes a second draft before enlisting a few beta readers for their feedback and finally ends the process with a third draft. It may take nine months to several years to produce a book, depending on how easily it comes to her and what else in life is going on. That’s still less time than the conventional publishing model; Natalie is a devotee of self-publishing, although seeing sales can take longer this way than letting a traditional publisher market her books. Natalie is committed to making her work accessible to her true audience: riders and horse lovers. She therefore makes her books available to Kindle readers via Amazon, which provides free versions for members of the Kindle Unlimited programme, who pay a monthly membership fee for a wide range of online books. Self-publishing also lets Natalie control the release dates and content for her novels, so there’s no pressure to endure what she feels are wasted pages explaining equestrian terms for non-riders. She has several books available as audio editions, great entertainment for mucking the stalls, and readers can order print copies for postal delivery as well. While Natalie reaches a demographic covering all ages and writes on a variety of riding disciplines, other writers may want to find a niche. There’s room for young adult equestrian fiction in particular, she recommends. It helps if you have a built-in audience when you start publishing, so she advises to start building readership early with a blog. Once writers have a following, they can use other methods to grow their audience or test new works, such as Patreon, a subscription platform for creatives. Of course, reading is essential. Natalie’s blog contains a wealth of generous tips for novices, and she herself is an avid reader of quality horse fiction. 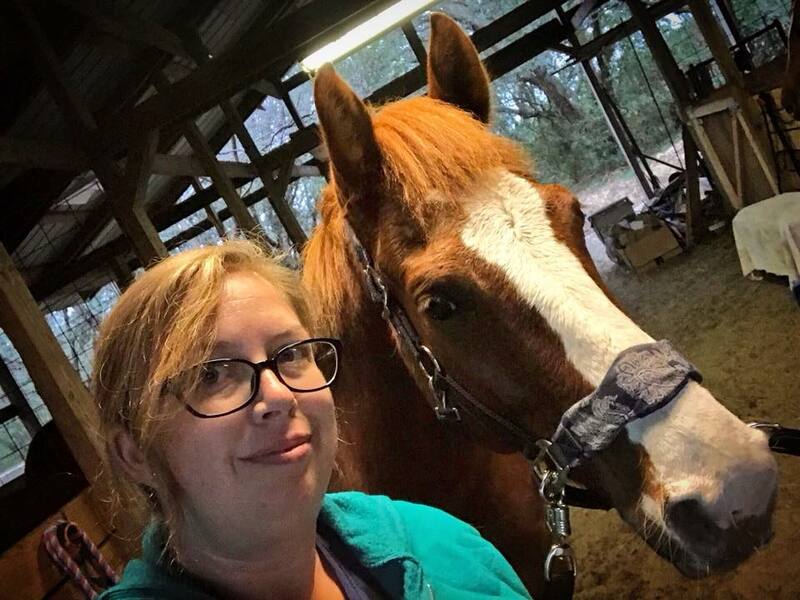 Her favourite authors include Mary Pagones, Tudor Robins, and the legendary Jane Smiley, who is, Natalie feels, “the levelling point between equestrian fiction and literary fiction that is also commercial.” Smiley straddles the line “in a beautiful way” and pulls together very ambitious storylines that appeal to both non-equestrians and horse fanatics.